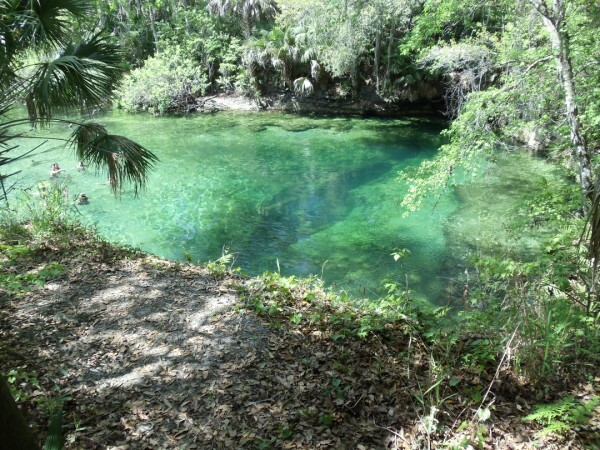 2, 600 acres and includes the largest spring on the St. John’s River the principal river in Florida. Blue Spring is designated as a Manatee Refuge and is the winter home to a growing number of Manatees. It is also one of Americas largest first-magnitude artesian springs, pouring out around 450 million litres of water every day. The water temperature is a constant 68°F which attracts the manatees from the cooler waters of the St. John’s River. Between the months of November and March you can observe the manatees from the elevated boardwalks at the side of the spring. You can also see numerous fish together with the occasional alligator. From the car park you can take the pleasant self-guided boardwalk to the source of the spring. In the hotter summer months the vegetation through which the boardwalks pass provide excellent shade. At this time of year, snorkelling and scuba diving are available in the crystal clear waters of the spring head. Canoeing and kayaking are also available and these can be rented at St. John’s River Cruises along the St. John’s River. The beautiful, peaceful surroundings provide a great place for a picnic. Two separate picnic areas are provided within the Park. There are covered pavilions with grills located at these areas and one has a large covered barbecue pit. Besides the recreation activities mentioned above there is an immensely enjoyable St. John’s River cruise. This is a two hour nature tour of this historic stretch of water which provides interactive narration of the flora and fauna in and around the river. This is a great way to round off a trip to Blue Spring State Park. If you wish to extend your stay, six, two bedroom cabins are available for rent and these are located in a shady oak hammock near Blue Spring. Those who wish to be even closer to nature can make use of one of the 51 campsites which are located within walking distance of the spring. The park is open from 8. 00am until sundown, 365 days a year. There is an entrance fee of $6. 00 per vehicle and a snack bar is available for the purchase of refreshments. Viewed 3724 times since 9 May 2010.